Contrary to what the name might indicate, Foobot is not a robot at all. On the contrary, it’s a hunk of white plastic that sits on the shelf and does only one thing: Monitor the air in your house for pollutants.A product that’s somewhat similar in design and function to the Netatmo Healthy Home Coach, the Foobot is an upright cylinder designed to be plugged in and left unattended. It does nothing on its own, but once you install Foobot’s app, you’re given a significant level of insight into your indoor air quality. 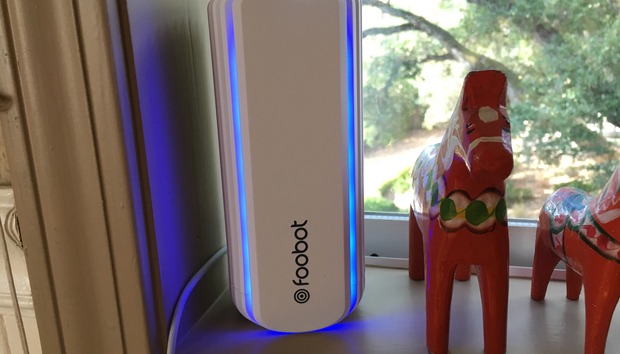 You’re probably used to various weather reports which assign a numerical value (and usually an easy-to-understand color) to the outdoor air quality, and Foobot works in much the same way. 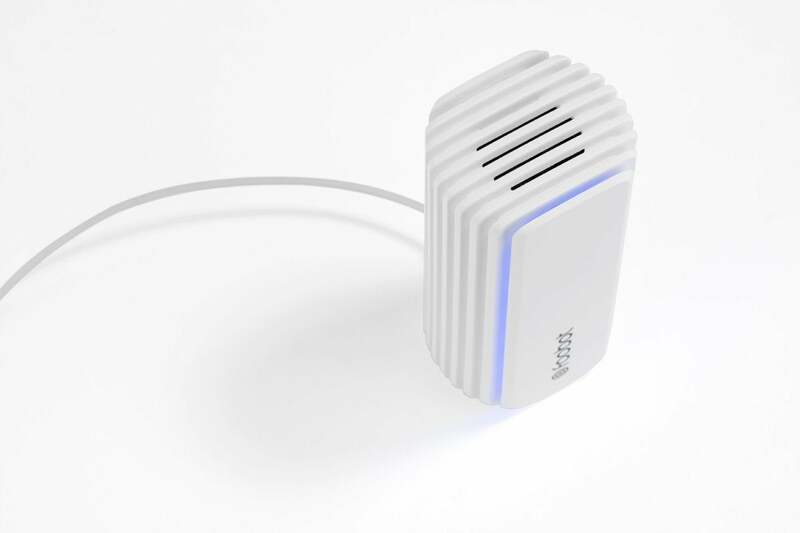 But rather than merely getting a single measurement of air quality, Foobot drills down into three different sub-components that define how healthy your air is. First is volatile organic compounds (VOCs), “toxic chemicals that can be dangerous even at low concentrations and have short and long-term adverse health effects,” which namely means formaldehyde given off by home furnishings. Second is particulate matter, which includes dust, ash, aerosols, and other fumes that are not filtered before inhalation and which can cause various diseases when they build up in the body; Foobot detects particles with a mass of 0.003 to 2.5 micrograms. Finally, Foobot reports on carbon dioxide, though this is interpolated from its volatile compound measurement instead of being directly measured. Humidity and temperature are also recorded. Link the Foobot to your smart thermostat, and it can trigger your ventilation system to circulate the air to improve its quality. All these figures are displayed on the Foobot app’s main screen. 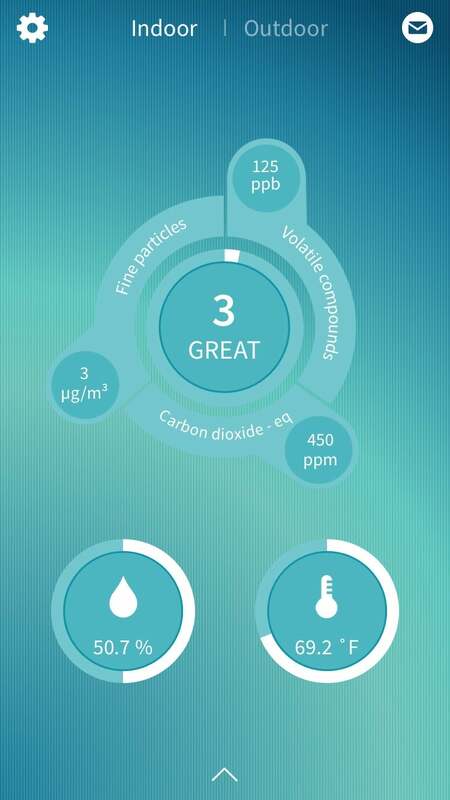 In the center of the screen, amidst all the detail, the app provides an overall rating of your air quality; lower numbers are better. Mine hovered under a 3 throughout my testing, on a 0 to 100 scale, which is pretty close to perfect. All this data is tracked over time and can be viewed historically (though the historical interface leaves much to be desired). As the description may indicate, there isn’t much to the Foobot. You plug it in, connect it to your Wi-Fi, and install the app. It took two tries to get the Foobot to connect to my network in my testing, but otherwise it worked fine. The app is very simple to use, and the primary display is very easy to understand. Be aware that it takes six days for the system to “warm up,” and push notifications are not activated until this time has passed. Again, I didn’t encounter any significantly bad pollution during my testing, though when I experimented by blowing smoke at the unit (and once when my son burnt some microwave popcorn), the Foobot was quick to note the problem—and fast to recover when the smoke cleared (which takes longer than you’d think). The Foobot app couldn’t be simpler to understand. One of the peculiarities of the Foobot is that it contains two lines of bright LEDs that are color-coded to your air health. If the LEDs are blue, everything is good. If orange, the air is bad. The longer the orange lines, the worse the problem. This is probably handy in a crisis, but there’s no way to explain just how bright this LED by default is without seeing it in person. Set in my window at night, it was a beacon for the entire neighborhood that looked a lot like the glow of a powerful bug zapper. Fortunately—and this is not well-documented—you can turn the brightness down in the app, and even turn the LED off altogether during times you specify (or forever). If you have the Foobot in a bedroom, this is a must, as it’s impossible to sleep with that glowing blue light in the room. If you want more from the Foobot than a snapshot of air quality, you’ll be happy to know that it does have a few smart home hooks, including support for IFTTT and Nest, plus some lesser-known smart devices including the Lux/Geo and Ecobee family of thermostats. The idea with the thermostats is that if air quality worsens beyond a certain threshold, it can cue your central air conditioner to start circulating air to improve it. The Foobot also supports Alexa, but this is largely limited to asking Alexa to tell you what your air quality level is. While I would have loved to have had this in my house during the recent California wildfires, which were raging just a couple dozen miles away from my front door and which clogged the air with smoke, 99 percent of the time I have no concerns about the air quality, either in my home or outside. Perhaps I’d feel differently if I lived in a house full of smokers, or in Beijing. I suspect most of us are in the same boat, and that at $229, Foobot is asking a lot of cash but not doing very much to earn it. « Should we believe the White House when it says North Korea is behind WannaCry?